Rich in vitamin A, iron and fiber, canned pumpkin promotes healthy eyesight, oxygen usage, energy production and digestion. Harvested in autumn, pumpkin is a seasonal vegetable, and you may not be able to purchase fresh pumpkin year round. Canned pumpkin allows you to benefit from this vegetable’s nutrients throughout the year. A serving of canned pumpkin blended into breads, muffins or pancakes can help you meet or exceed your daily requirement of several essential vitamins and minerals. During commercial processing, pumpkin is mashed into a dense mass, then sterilized with heat and canned under pressure. Pumpkin is a low-acid vegetable, which makes it prone to contamination, according to the University of Minnesota Food Safety Team. Canning boiled, cubed pumpkin at home may be considered safe, but the density of mashed or pureed pumpkin makes it difficult to heat-sterilize this food in a nonindustrial setting. With its concentrated density, canned pumpkin has more calories per serving than fresh pumpkin and higher amounts of several essential nutrients. One-half cup of canned pumpkin has 40 calories, 9 grams of carbohydrates, 5 grams of fiber, 0.5 gram of fat, 5 milligrams of sodium and 2 grams of protein, according to the University of Illinois. One-half cup of canned pumpkin has 17,500 international unites of vitamin A, almost twice the amount one-half cup of fresh pumpkin provides. This serving also includes 4.8 milligrams of vitamin C, 40 milligrams of calcium and 2 milligrams of iron. Canned pumpkin offers more fiber, protein, vitamin A, calcium and iron than fresh, boiled pumpkin. The vitamin A in one-half cup of canned pumpkin represents 350 percent of the vitamin A you need each day, according to the University of Illinois. 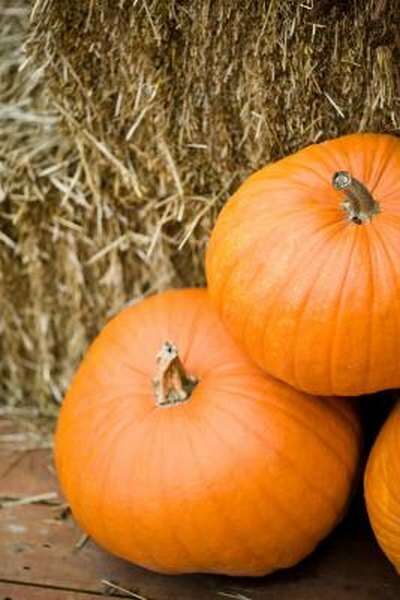 Canned pumpkin is also rich in beta-carotene, a deep orange pigment that allows vitamin A to be produced in your body. Vitamin A promotes the health of your eyes, skin and connective tissues. Beta-carotene is an antioxidant compound that may protect you against the cellular damage that leads to cancer, heart disease and early aging. The fiber in canned pumpkin promotes the health of your digestive tract and may lower your risk of heart disease and type 2 diabetes, according to the Harvard School of Public Health. Canned pumpkin is a healthy alternative to fresh pumpkin, but check the label to make sure you’re buying plain, canned pumpkin rather than pumpkin pie filling. Pumpkin pie filling may have added sugar and sodium and is higher in calories than plain pumpkin. Look for labels that simply read “pumpkin” or “100 percent pumpkin,” to ensure that you're only getting pure pumpkin. Like other canned foods, canned pumpkin may become contaminated by bacteria, but pumpkin's low acid content makes it especially vulnerable to botulism, according to the Michigan State University Extension. If a can of pumpkin bulges at the ends, if liquid spurts out when you open the can or if the pumpkin has a strong odor, the USDA advises you discard it. Use canned pumpkin by the “Best By” date printed on the label. After opening canned pumpkin, refrigerate the unused portion in a sealed, nonmetal container. Can You Eat Wheatgrass Raw? What Is the Nutritional Value of a Gala Apple?